My father’s father’s surname was Lymberopoulos. It was a Greek mouthful worthy of Demosthenes, but in the days of turn-of-the century immigration in America when ethnic pride was discouraged, the name was changed to Peterson. Because my father’s father’s father’s first name was Peter, my father’s father was Peter’s son. Peterson! To further muddy the waters, in keeping with the Greek tradition of naming the first-born son after the paternal grandfather, my father’s first name was Peter; ergo his name was Peter Peterson, even though he wasn’t really Peter’s son, but Peter’s grandson. When strangers were introduced to Susan Peterson, they would often do a double- take, trying to reconcile my Scandinavian name with my very un-Scandinavian appearance. Like many Greek girls, I was endowed with sideburns, moustache, unibrow and a Neanderthal hairline. That lovely Grecian kisser sat atop a squat olive-green body supported by sturdy, furry legs. One day when I was 12, I sequestered myself in the bathroom and attacked my right leg with a pumice stone. After an entire exhausting afternoon spent rubbing the abundant hair off from the knee down, I eventually got up the nerve to confess to my mother, who took rare pity on me and handed me a “safety” razor with a double-edged blue blade. Armed with the razor and a bar of soap, I got into the bathtub and proceeded to remove the hair and half the skin from my left leg. Unable to dissuade me from my insane plan to grow up, Mom eventually admitted she was licked and one day presented me with a pair of nylons and a garter belt. I guess the “How to Sit Like a Lady” lesson came later. Great mom… Just so great! Susan, these are so much fun to read! My similar shaving story happened the day of Joanne and Bob’s wedding! That was hysterical!….and I felt your pain! 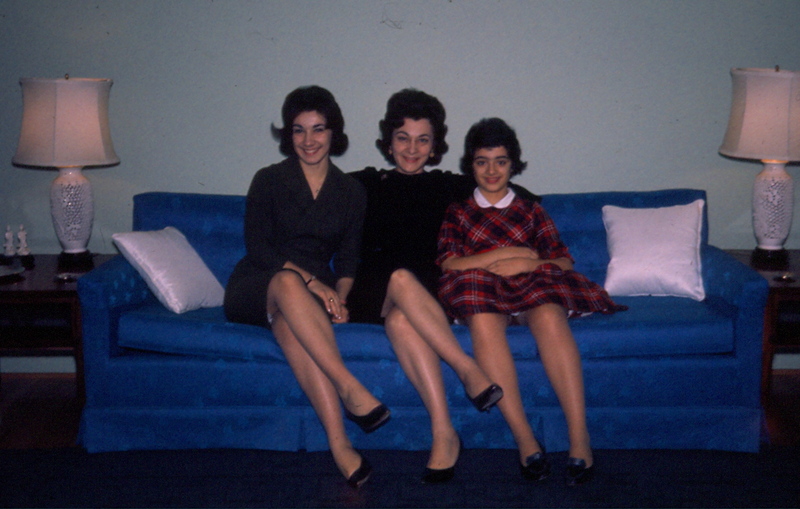 Susan and Patti, I too suffered with “gorilla legs” when I was in the 7th grade. I’ll never forget having to wear lacy ankle socks to the first day of school with my hairy legs, black patent maryjanes and my dotted swiss party dress while all the other girls wore straight skirts with clean shaven legs, peds and flats. Any wonder I’m a little insecure. Susy, I just couldn’t stop laughing with this one. Keep them coming.